#308 Bob Breunig. #321 Drew Pearson. Dallas Cowboys. #328 Everson Walls. #327 Everson Walls. #329 Danny White. All our graded card holders are in mint condition and crack free unless noted otherwise. After 35 years, I am now opening my card collection up for sale. I have thousands of football, baseball, basketball, and hockey cards from the 1950’s to early 1990’s including stars, rookies, and hard to find low population commons. ~THIS CARD IS IN REALLY NICE CONDITION~. The digital images we display have the most accurate color possible. However, due to differences in electronic displays, we cannot be responsible for variations in color between the actual product and your display. 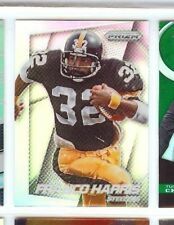 FRANCO HARRIS 2010 Topps Tribute BLACK Refractor Parallel SP 42/75 STEELERS Hot! Trying to complete your set?. Let us help you! Collect a favorite team or player?. You can also find cards of players in your favorite NCAA uniform by searching our college team categories. All other countries: FREE. FRANCO HARRIS. FOOTBALL CARD #355. Card is mint/nr. mint condition. This card is in NM/MT condition. 2000 Franco Harris Topps Finest Moments Refractor Insert Card #FM6! MINT! Mint condition. The card you receive will be in. FOR SALE IS A VERY NICE CARD AS YOU CAN SEE PICTURED IN THE SCAN. CARD IS IN "EX " CONDITION, WITH NICE CORNERS, NO CREASES, CLEAN BACK, AND A LITTLE BIT OFF-CENTERED.CHECK OUT THE SCAN AND JUDGE FOR YOURSELF.VERY NICE CARD! Available is The Factory Fresh Card Stated In The Title And Showing It's Condition On The Scan. Here is a nice insert card for your collection that sports sharp corners, clean edges, nice centering, and great color and gloss. You will enjoy owning this cardboard gem. FREE Trial! This card sports sharp corners, nice edges, nice clean surface, great color and gloss, and decent centering. You will enjoy owning this football card gem that is in collectible condition. This card sports corners that have light wear, clean edges, nice clean surface, great color and gloss, and decent centering. You will enjoy owning this football card gem that is in collectible condition. NO MATTER HOW MANY CARDS THAT YOU BUY! FRANCO HARRIS. A great looking card that is in. THIS IS CARD #3 IN NM/MT OR BETTER. Great piece of 70’s football. Card is in Ex condition with a clean front and back, no creases/wrinkles and descent corners. Scan is of the actual card, so you can see the condition for yourself.